People today are going back to their roots; they are in search of lost recipes, unique and local ingredients, spices and raw materials. Thanks to growing food culture, Indian food business scenario has taken a new shape. Instead of eating the same old junk foods including pizza and burger, people today are looking at Indian ethnic foods when they are ordering their meal. Surprisingly, not only during lunch and dinner time, biryani is being consumed for the breakfast as well. According to a latest survey by food-tech start-up Swiggy, Biryani capital, Hyderabad, has seen people ordering biryani even during snack time- between lunch and dinner-when orders in other cities gravitated toward street food and burgers. This has given a tough competition to many QSRs as we have seen entry of biryani QSRs and delivery players in the business. “Biryani is the next big food category in India after Pizza. Domino’s India is today around Rs 2000cr sales turnover with 1000 outlets. There will be 2-3 Biryani players in India in next 3-4 years with around Rs 500cr turnover each or more,” shares Kaushik Roy, Founder and CEO, Biryani by Kilo, adding that Biryani is a complete meal with carbohydrates(rice) and proteins(meat/vegetables), both aromatic and flavoursome, and caters itself to delivery. Biryani has the potential to become the India answer to Italy’ Pizza & Chinese’ Noodles worldwide. People today are going back to their roots; they are in search of lost recipes, unique and local ingredients, spices and raw materials. This trend in itself has pushed a chartered growth of many brands who are focusing on flavoursome Indian food be it the lost recipes from the Mughal Era, endangered spices form Uttarakhand and southern part of India, recipes that have been never featured in any restaurants and the historic super food ‘Sattu’ that the Magadh and the Patliputara region offers. “Within two months you will see a Mughlai restaurant as well on the same pattern where we will be exploring the lost recipes and foods from Mughal Era. We will be showcasing traditional Mughlai food – there will be menus from Shahjahan’s Era, Humayun’s Era. We will showcase how food travelled from that era and changed today as the food of Shahjahanabad,” adds Osama Jalali, Owner at Masala Trail which is serving the street food delicacies from different regions of India. As most of the QSR restaurants that are here in India is focusing on delivery as a business driven by this trend these Biryani players have also built up a technology where they are trading on delivery business. Places like Biryani Blues have 60% delivery orders whereas only 40% come to dine at the restaurant. “Our focus is to grow delivery as we are a QSR restaurant. 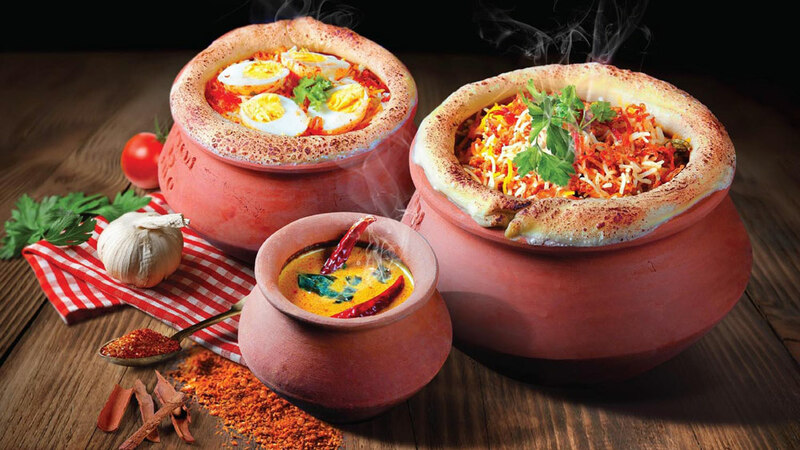 Our end target is if somebody wants to have Biryani in Delhi-NCR he should be able to get it delivered within 30 minutes,” says Raymond Andrews, Co-Founder at Biryani Blues who started his first restaurant along with wife Aparna in March 2013 as coming from Hyderabad they were missing the original Hyderabadi Biryani in Delhi-NCR. “If somebody really likes to have the piece of Hyderabadi Biryani they either order it via courier or fly down to Hyderabad to taste the Biryani,” laughs Andrews. Similarly, Delhi-NCR based Biryani by Kilo is also getting a similar number of online orders and is not focusing on a QSR concept as they take almost 90 minutes to deliver the freshly cooked Biryani. “BBK has a huge strength in technology and processes. We use the cutting edge ERP, POS, Call Centre, CRM & Kitchen technologies,” adds Roy. Also, as per Swiggy research, in main course, the Indian cuisine--in its various north and south avatars--emerged more popular than its American and Chinese competitors. Most popular non-vegetarian main course item was chicken biryani, except in Delhi-NCR where top six dishes were dal makhani-naan, burgers, chole bhature, egg rolls, masala dosa and pav bhaji. Hence, with such an opportunity we really can say that Biryani could be the next food disruptor in India with growing palate for the cuisine.